Not every story has to have a moral. Ironically, that's the idea behind newly relocated Brooklyn rapper Aesop Rock's latest record, Bazooka Tooth. An underground MC since the mid '90's, Aesop achieved wider fame in 2001, when he was still living on the Lower East Side, with his debut on esteemed hip hop label Definitive Jux, Labor Days. 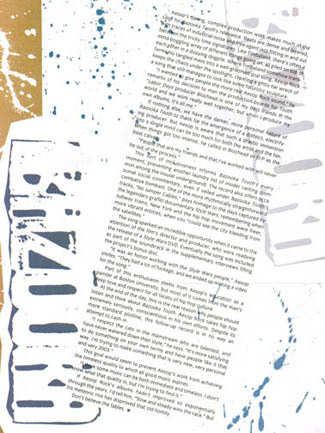 Shot with Aesop's now signature heavyweight vocabulary, and supported by stylish production courtesy of Blochead, the record wowed the critics and fans with its fly-on-the-badly-papered-wall depiction of working-class struggle. AN exploration of the nine-to-five life, the album's rapid, stiletto-sharp style and grimy detail tagged Aesop as the intelligent, ethical savior of hip hop, the hero who would right the bling-obsessed genre's moral compass. Being assigned a messianic role you neither wanted nor asked for is a lot of pressure. Tired of answering questions about his favorite books or personal politics, the rapper went into seclusion, moving away from the rapidly gentrifying East Side to the drab warehouses of Brooklyn's Bushwick neighborhood. He also quit his day job as an assistant at an art gallery to concentrate on being a 24/7 rhymeslinger. Now, he's back with Bazooka Tooth, a very different beast indeed from the message-oriented Labor Days. "Diamond cutter spine/Armadillo armor that wraps around the blade," shouts the first line of the title track. From there, the album erupts in a storm of tightly wired beats and A-Rock's caustic thoughts on celebrity, the state of hip hop, and the Guilianification of New York. 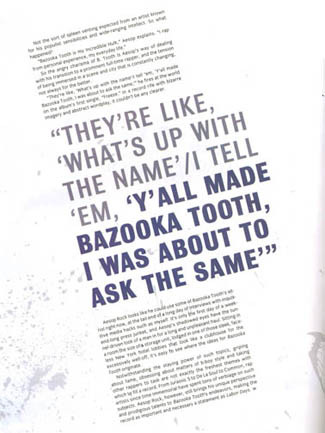 Bazooka Tooth is the album's central character, a persona better equipped to deal with the pressures of being famous (see the line above about armor) and capable of unleashing devastating salvos against everything he finds wrong with the world. "You don’t want me smiling' at your cameras," he smirks bitterly at the end of his introduction. Not the sort of spleen venting expected from an artist known for his populist sensibilities and wide-ranging intellect. So what happened? "Bazooka Tooth is my incredible Hulk," Aesop explains. "I rap from personal experience, my everyday life." So the angry charisma of B. Tooth is Aesop's way of dealing with his transition to a prominent full-time rapper, and the tension of being immersed in a scene and city that is constantly changing, not always for the better. "They're like, 'What's up with the name'/I tell 'em, 'Y'all made Bazooka Tooth, I was about to ask the same,'" he fires at the world on the album's first single, "freeze." In a record rife with bizarre imagery and abstract wordplay, it couldn't be any clearer. 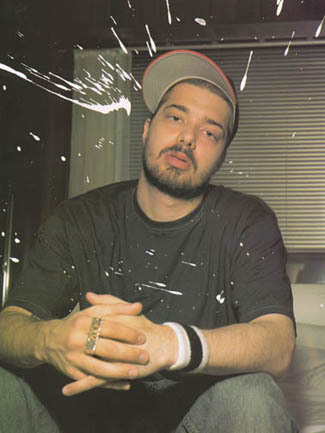 Aesop Rock looks like he could use some of Bazooka Tooth's vitriol right now, at the tail end of a long day of interviews with inquisitive media hacks such as myself. It's only the first day of a weekend-long press junket, and Aesop's shadowed eyes have the tunnel-driven look of a man in for a long and unpleasant haul. Sitting in a room the size of a storage unit, lodged in one of those sleek, faceless New York hotel lobbies that look like a clubhouse for the excessively well-off, it's easy to see where the ideas for Bazooka Tooth originate. Notwithstanding the staying power of such topics, griping about fame, obsessing about matters of b-boy style and taking other rappers to task are not exactly the freshest themes with which to fill a record. From Jurassic 5 to De La Soul to Common, rap artists since time immemorial have spent tons of verbiage on such subjects. 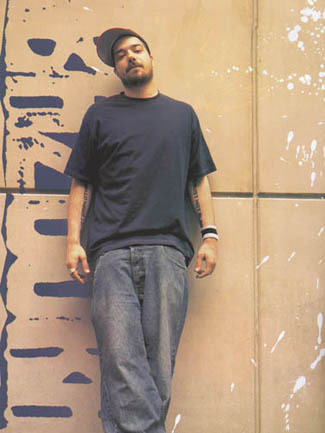 Aesop Rock, however, still brings his unique perspective and prodigious talents to Bazooka Tooth's endeavors, making the record as important and necessary a statement as Labor Days. Aesop's daring, complex production work makes much of the case for Bazooka Tooth's relevance. Beats are dense and layered, with traces of industrial noise and free-agent jazz flitting in and out between the tricky time signatures. Like Timbaland, there's often a mind-boggling array of different things going on, all piled on top of each other in a dizzying dogpile. 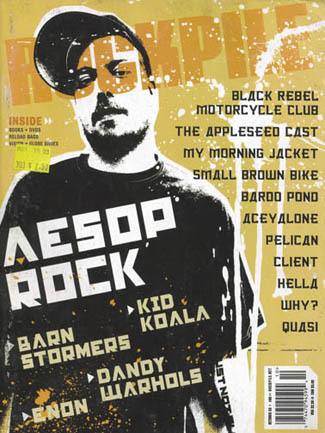 Where Timbaland somehow transforms his tangled mass into a well-groomed pop song, Aesop Rock keeps the chaos under the spotlight, creating a gritty car wreck of a song that still manages to look like some futuristic sculpture. 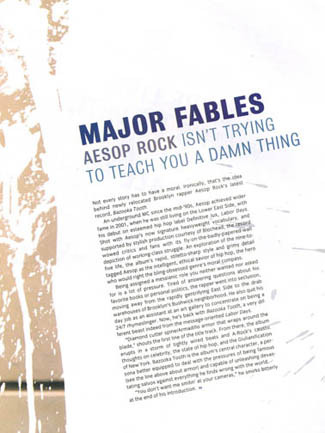 "I wanted to give people the more real Aesop Rock sound," he remarks of his decision to man the production boards for Tooth. "Labor Days producer Blochead is one of my best friends in the world and we work really well together, but when I produce my own albums, it's all me." If nothing else, we have the darker, more personal nature of Bazooka Tooth to thank for the emergence of a distinct, electrifying producer. But Aesop is aware that such a drastic immersion into a single mind can be too much for both the artist and the fan. When things got too intense, he called in Blochead of El-P as the beat cavalry. "People that are my friends and that I've worked with will never be out of the process." This sort of inclusiveness informs Bazooka Tooths' every moment, preventing another laundry list of insider ranting (common among the insular underground). The record also offers occasional social commentary, even if veiled under Bazooka Tooth's combative bombast. One of the more rhythmically straightforward tracks, "No Jumper Cables," pays homage to the days captured by the legendary graffiti documentary Style Wars, remembering when subway trains, New York and the hip hop movement were freer, more vibrant entities, when you "could see the city bleeding from the satellites." The song sparked an incredible opportunity when it came to the attention of the film's director and producer, who were readying the release of a Style Wars DVD. Eventually the song was included as part of the soundtrack in the supplementary interviews filling the project's bonus disc. "It was an honor working with Style Wars people," Aesop smiles. "They had a lot of footage, and we ended up making a video for the song." Part of this enthusiasm stems from Aesop's education as a painter at Boston University, but most of it comes from the man's deep love and respect for all facets of hip hop culture. At the end of the day, this is the real reason why people should listen and think about Bazooka Tooth. 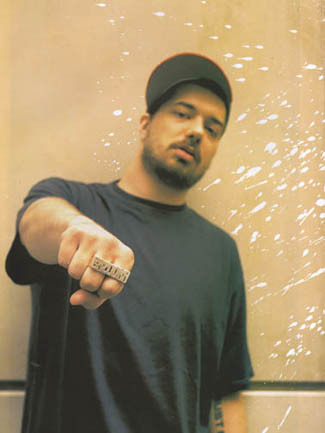 Aesop Rock takes hip hop extremely seriously, conscientious in his own efforts. Despite its more standard plotline, the follow-up record is in no way an attempt to cash in. "I respect the cats in the mainstream who are talented, and have never watered down their style," he says. "It's more satisfying doing something on your own terms and have people like it that way. I'm trying to make something that is very new, very personal and very 2003." This goal would seem to prevent Aesop's work from achieving the timeless quality to which all good music aspires. "I think some music can be both immediate and timeless. I don't know what that quality is, but I'm trying to find it." If Aesop Rock's albums hadn't improved so exponentially through the years, I'd tell him, "Slow and steady wins the race." But his meteoric rise has disproved that old homily.